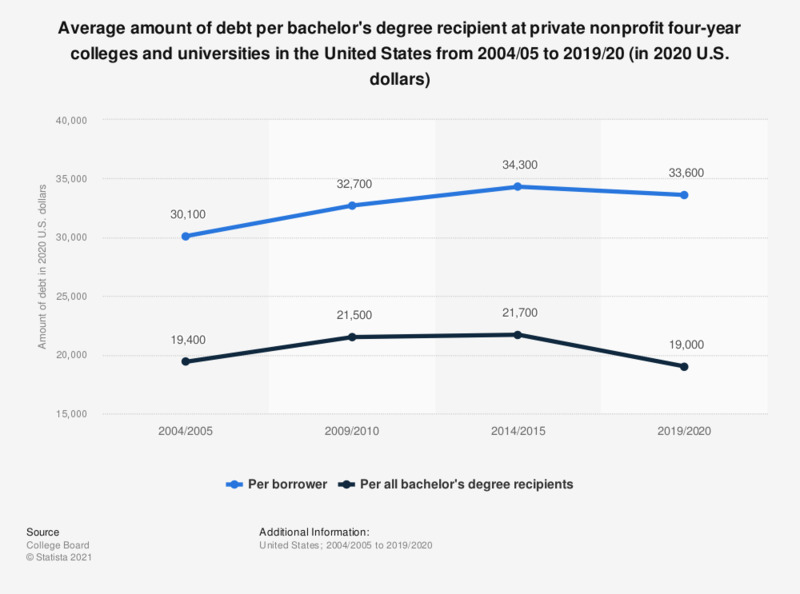 This statistic shows the average amount of debt that bachelor's degree recipients from private nonprofit four-year colleges and universities had from the 2001/02 academic year to the 2016/17 academic year. The per borrower category shows the average amount of debt amongst bachelor's degree recipients who had taken student loans. The average per all bachelor's degree recipients includes those who did not take student loans. In the academic year 2016/17, students who took out student loans had an average of 32,600 U.S. dollars worth of debt upon completion of their degree. Per borrower, shows the average amount of debt amongst bachelor's degree recipients who had taken student loans. The average per all bachelor degree recipients includes those who graduated without any student debts. How did you finance your college costs?